The structural evolution of Lake Van Basin, eastern Turkey, was reconstructed based on seismic reflection profiles through the sedimentary fill as well as from newly acquired multibeam echosounder data. The major sub-basins (Tatvan Basin and Northern Basin) of Lake Van, bound by NE-trending faults with normal components, formed during the past ~600 ka probably due to extensional tectonics resulting from lithospheric thinning and mantle upwelling related to the westward escape of Anatolia. Rapid extension and subsidence during early lake formation led to the opening of the two sub-basins. Two major, still active volcanoes (Nemrut and Süphan) grew close to the lake basins approximately synchronously, their explosive deposits making up >20 % of the drilled upper 220 m of the ca. 550-m-thick sedimentary fill. During basin development, extension and subsidence alternated with compressional periods, particularly between ~340 and 290 ka and sometime before ~14 ka, when normal fault movements reversed and gentle anticlines formed as a result of inversion. The ~14 ka event was accompanied by widespread uplift and erosion along the northeastern margin of the lake, and substantial erosion took place on the crests of the folds. A series of closely spaced eruptions of Süphan volcano occurred synchronously suggesting a causal relationship. Compression is still prevalent inside and around Lake Van as evidenced by recent faults offsetting the lake floor and by recent devastating earthquakes along their onshore continuations. New, high-resolution bathymetry data from Lake Van reveal the morphology of the Northern Ridge and provide strong evidence for ongoing transpression on a dextral strike-slip fault as documented by the occurrence of several pop-up structures along the ridge. 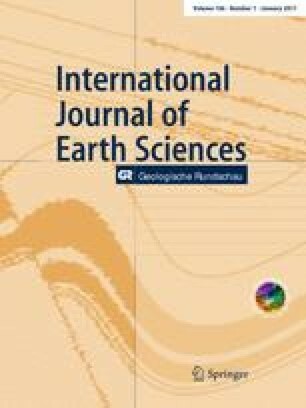 The authors acknowledge funding of the PaleoVan drilling campaign by the International Continental Scientific Drilling Program (ICDP), the Deutsche Forschungsgemeinschaft (DFG; Grants KR2222-9, KR2222/15 and SCHM 250/93-1) and the Swiss National Science Foundation (SNF Grants 20FI21_124972, 200021_124981 and 200020-143340). This work was also supported by the Marine Geological and Geophysical Mapping of the Korean Seas Project (GP2015-042) and by the Study on marine geology and mineral resource in buried paleochannel of Seomjin River, South Sea, Project (GP2015-040) for DC, GSK and SPK and the EU Seventh Framework Programme for Research and Technological Development (Marie Curie International Outgoing Fellowship, Contract PIOF-GA-2012-332404) for YT. Senay Horozal was supported by part of the project titled ‘International Ocean Discovery Program,’ funded by the Ministry of Oceans and Fisheries, Korea (Grant: 20110183). We thank our colleagues from the Istanbul Technical University (Istanbul, Turkey) and from the Kiel University (Kiel, Germany) team for support during data collection. Special thanks go to our captains, Mete Orhan and Munip Kanan, for their untiring commitment during the seismic data acquisition.